Potato is a staple food in many parts of the world, it is a versatile and humble root vegetable and it is used in almost all types of cuisines. Potato is used in many interesting ways. It has found an important place in a wide range of nonfasting and fasting recipes which could be sweets or savory. 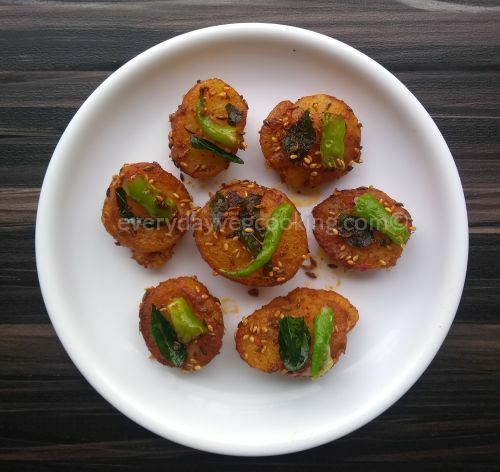 Today I am sharing the recipe of fried, crispy chatpate aloo ke tuk, which is a popular tea time fasting snack. In this recipe, potatoes are deep fried until golden in colour, then potatoes are flattened and tossed with spices. The recipe is very simple and easy. Sendha namak (rock salt) according to taste. Desi ghee (clarified butter) or refined oil for deep frying potatoes. Rinse potato, peel and cut into halves. Prick potatoes evenly all over with a fork. Take water in a bowl, add half teaspoon salt and soak pricked potatoes in it for 15 minutes. Take out potatoes from the water and wipe with clean kitchen towel. Cut green chillies into half inch pieces. On low flame, deep fry potatoes in medium hot oil until crispy and evenly golden brown in colour. Drain fried potatoes on an absorbent paper. Let potatoes cool for a few minutes . Now take each fried potato between the palm , press delicately and flatten it. 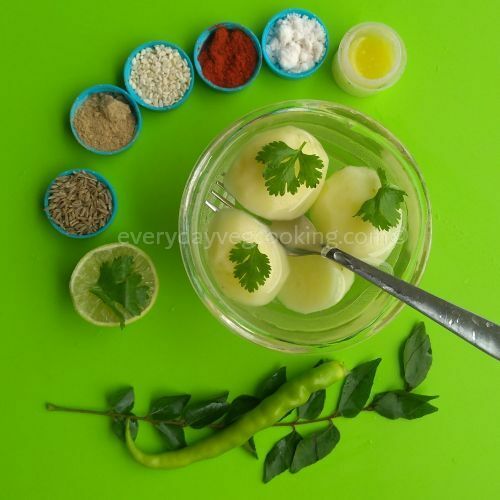 Heat 1 tbsp desi ghee or refined oil in kadhai, add jeera and sesame seeds (til). When they sizzle, put curry leaves and green chillies and saute for a few seconds. Now add flattened potatoes, sprinkle red chilli powder, salt and amchoor powder and stir it lightly till masala coats evenly around potatoes. Cook for one minute and switch off the flame. Squeeze lemon juice as required. Tempting and delicious Aloo ke Tuk are ready to serve.